In today’s incredibly important dude fight news, Kanye West and Deadmau5 have been making dry jokes about each other on Twitter for the past few hours. It all started when West tweeted a photo of his computer screen where he appeared to be listening to Sufjan Stevens. The photo also happened to show Kanye’s Safari browser with several tabs open. Impressively, he didn’t have more than 50 tabs open, but one of them was a search for the production software program Serum on the Pirate Bay torrent site. Twist: Deadmau5 (or Dead Mow Five) owns part the company that makes Serum. Keen as he is, Dead Mow Five noticed and tweeted the observation. Dead Mow Five continued with this roast. It’s hard to tell whether celebrities are being serious with their Twitter fights, so who knows if this friction is real (conspiracy?) 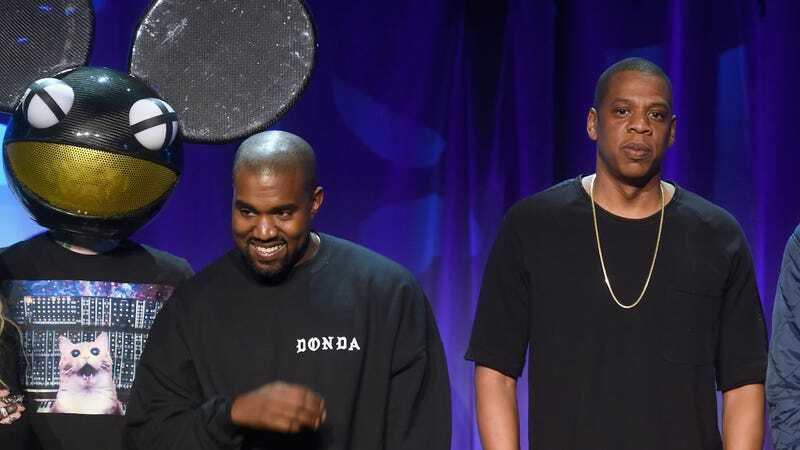 But if so, these two should not be fighting because they have too much to lose—they’re both Tidal investors, after all. Kanye, you should know! You stood right next to him at Mission Launch Tidal. Did you not ask his name? Knowing that his tweets will inevitably be written about, Kanye used the opportunity to shoot off a few dad jokes about Dead Mow Five (and his mouse head) that landed flat. Ha....ha... And then some weird tweets about a party.